Did I mention that I've been busy? 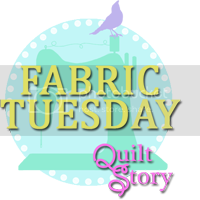 After promising to write a proper post about Cadi's quilt, the next day I disappear for almost a week! I do have an excuse reason - Hubbie took some time off work and we've been moving things around a bit here. It means that I've lost my sewing room but Marged has gained a bedroom and we've got our bedroom back! (Don't worry - my sewing machine has found a new home - I hope to share some pictures before the end of the week). Another excuse reason for things being quiet around here is carnival week. Every year the village as a week of events which culminates in the carnival. The eagle eyed amongst you might be able to 'spot' the lining fabric. I never made those curtains to match Marged's quilt! This year I wanted to make a real effort. Remember this picture? 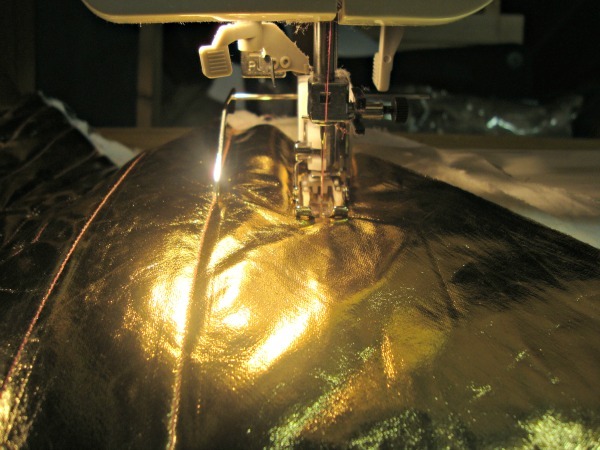 So last Thursday I realised that I only had one whole day to get this done and I hadn't even bought the fabric :-o As Anwen's school trip was on Friday there was no way that I'd be able to get to a fabric shop in time so I asked my mum to get a meter of gold fabric for me. She didn't think that a meter would be enough but I reassured her that it would be more than plenty. After the trip I quickly called with my mum on the way to a meal with friends to collect the fabric and realised that a meter of 44" wide fabric would have been plenty but maybe a meter of 25" wide fabric(?) would be a stretch! Oh well, I'd have to do the best I could as there was nothing I could do about it now. I arrived home from a lovely meal with my friends at around 11.30pm and immediately started making my quilt sandwich. As it wasn't a very big piece of fabric it didn't take long and I was quilting in no time. As soon as Anwen was up in the morning I tried the duvet for size and then got going on cutting the pieces out. 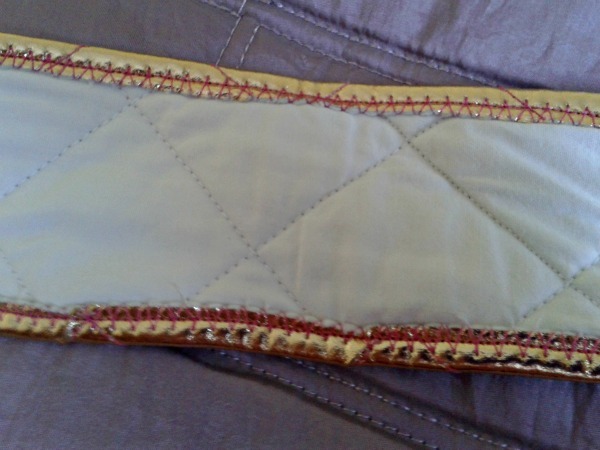 I zig zagged all of the raw edges and then just did a single hem as I thought that it would be too bulky otherwise. The shorts part came out quite well - they were quite big but Anwen's a growing girl and I hope that she'll want to wear these after the carnival (for dressing up obviously - not shopping!) I didn't have much of my quilt sandwich left so I cut off two long strips for the straps and made the front of the dungarees out of what was left. 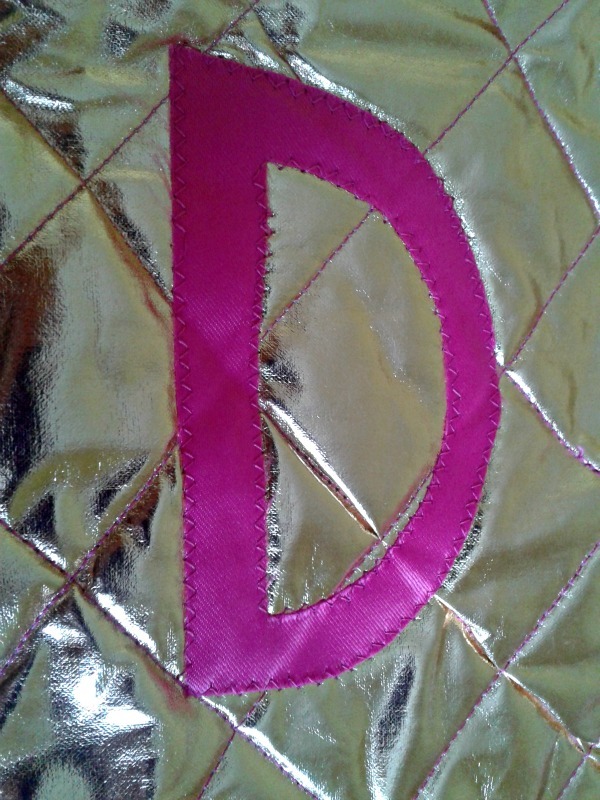 I used a piece of hot pink satin left over from my wedding to make the 'D' and just crossed my fingers that the gold fabric didn't do something awful (like melt) when I used the iron to heat and bond it. I drew the D freehand in an atempt to save time - I shouldn't have. Next was buttons. Why hadn't I thought of buttons? 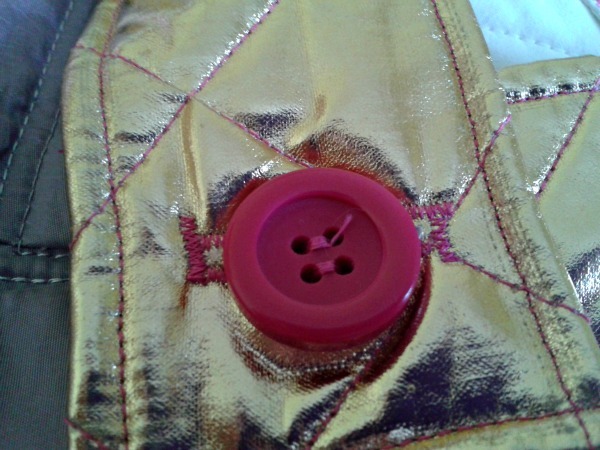 Dona's dungarees have big bright pink buttons and I didn't have any in my tin! I went rummaging through Anwen's old clothes in the attic and found a coat with just the right buttons. They were just a little too big for the buttonhole making foot on my machine though so I had to wing it. And that was it - the dungarees were ready. All I needed now were the cap and jacket! There was no way that I was going to be able to make the jacket as it was now after midday and the carnival started at two! I had a root around in the cupboard and found Anwen's old rain coat. It wasn't very clean but it still fitted her and after I removed the hood it did look quite similar to Dona's jacket. 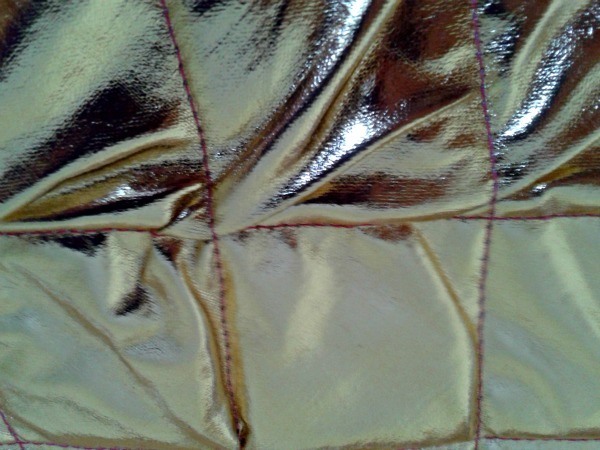 Luckily I'd had the foresight to cut some thin strips off the gold fabric before quilting it so I sewed these on by hand. 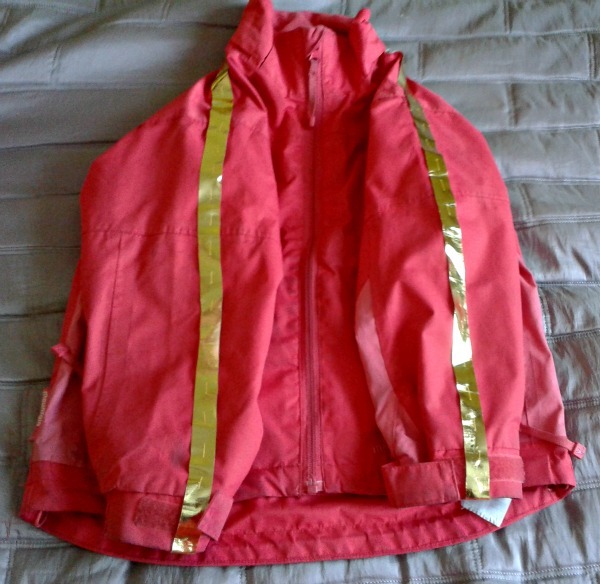 I used very long stitches as I didn't want the raincoat to have too many holes in it when I removed the stripes. ugh, those cuffs are filthy, I can't believe that I'm actually posting a picture of them. 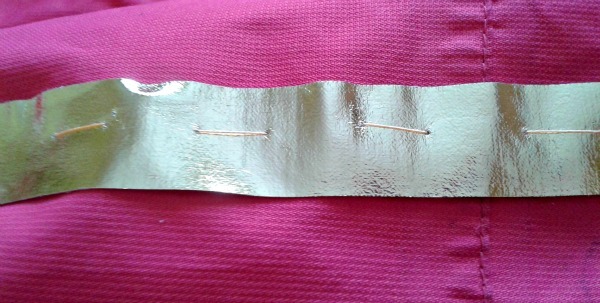 I was fast running out of time so I only managed to sew one strip onto each arm whilst there should have been two. 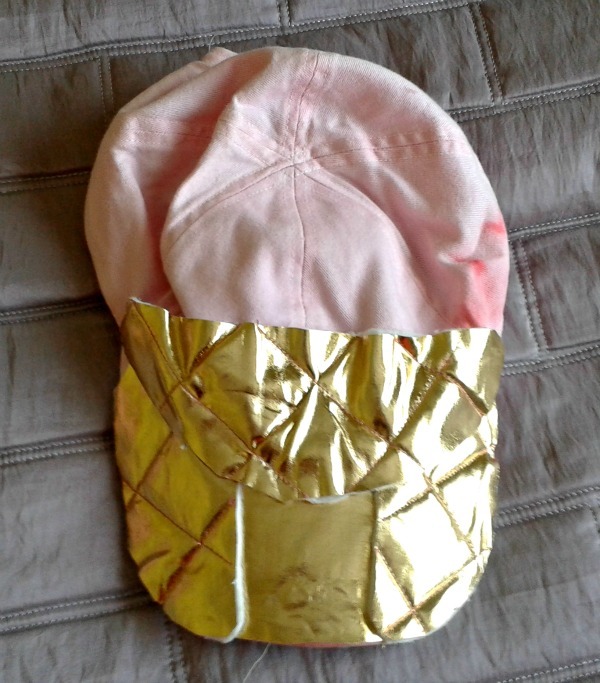 Whilst I was finishing off the jacket Dadi had been given the task of adding some gold to Dona's cap. See the staining on the right? That's from when Anwen had previously tried to turn this into Dona's cap by writing a big D on it with felt pens! I hadn't left him much to work with but he didn't do too badly fair play. So that was it. Dona was ready. It was 1.10pm and I was still in my jammies! We did arrive a little late at the carnival and missed the procession through the village so I parked in the car park next to the park and as soon as she got out of the car Anwen was met by a barrage of calls from her friends. "Dona! It's Dona Dereidi! Is it you Anwen? Wow cool!" Anwen spent quite a bit of time showing her new outfit to her friends and I only managed to get one picture of her with anyone else's kids in it. She doesn't look very happy but that's because I'd stopped her from running after one of her friends so I could take this pic! Then it was time for the judging. 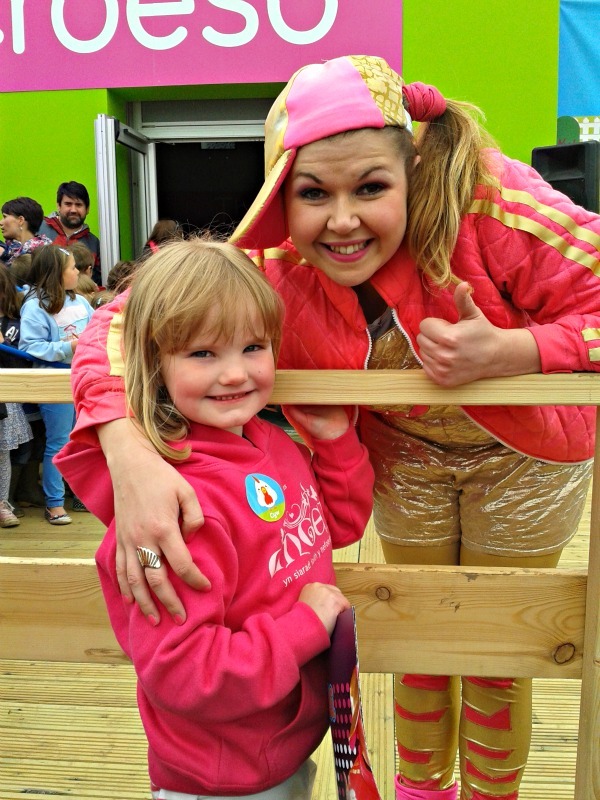 Anwen was in the under fives category and didn't win a thing! 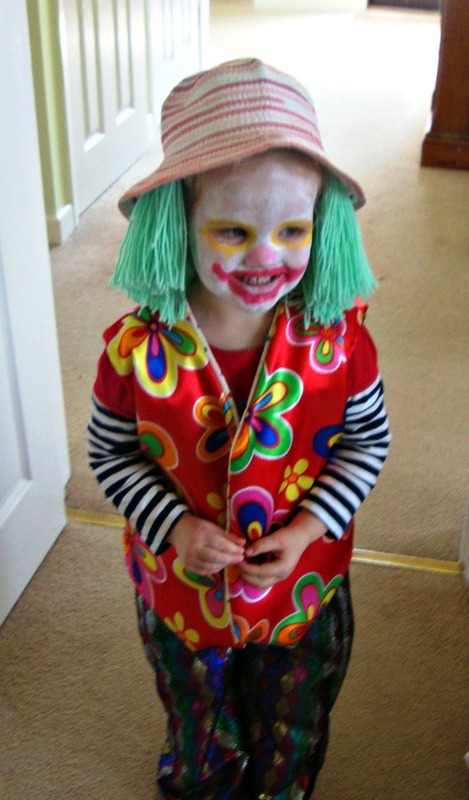 She lost out to a shop bought bumble bee, a pirate and a (very good, homemade) bubble girl. 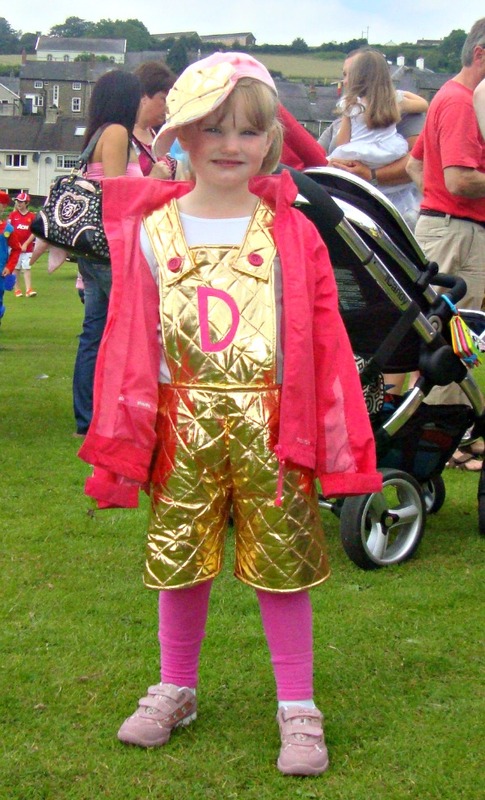 I'm not usually a bad looser but all the other kids thought that Anwen was the bee's knees and their mums asked me where I'd bought the dungarees! I'm consoling myself with the fact that the judges were old farts that wouldn't recognise a kids tv character if they bit them on the nose! The most important thing though was that Anwen loved it and was SO proud. 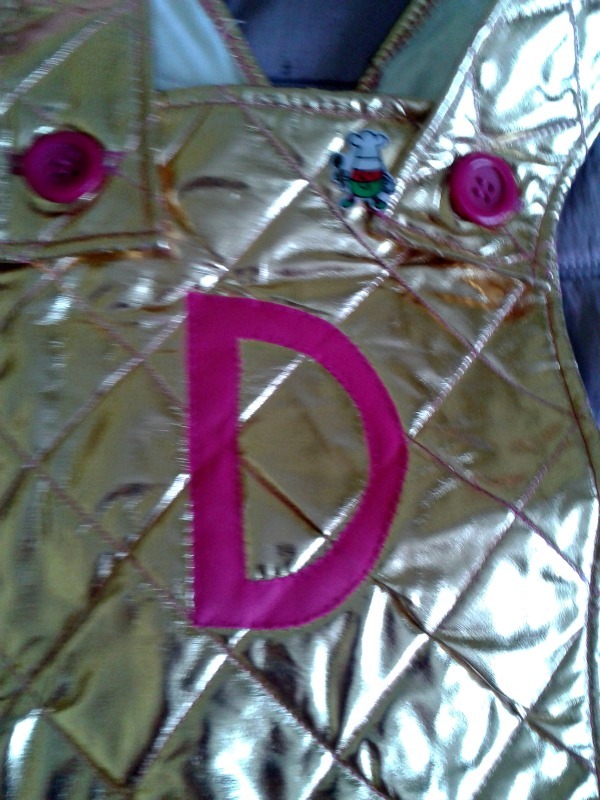 Today is Anwen's turn to take something that she loves into school and she wanted to take her Dona outfit so I'm happy. This is terrible! I'm so sorry she didn't win, I always loved all the handmade costumes my mom made me. Also, maybe it's a little odd, but I would love to have a pair of those metallic quilted overalls! Awesome job! Wel am Dona Direidi GWYCH! Y plant fan hyn yn eiddigeddus! Ia-wyyyn?! Well done! You did an amazing job, it looks fabulous! You upcycled the coat as well as the buttons! And just think how much fun you can have showing that picture to all her friends when she's 18!! Priceless ;-) thanks for linking up! well done on the costume - the judges were clealry blind. Sorry about the fine too, that is rotten.